No such luck reuniting Katie and Kaitlin last night. RSL & BamBam, leave a comment (or send me an email) telling me what time you are going to be playing tonight (Wednesday) and I will try my best to get on AC at that time. It’s Wednesday, and you know what that means… it’s time to visit Crazy Redd’s! This week he’s selling a Triforce, an Amazing Painting, and a Classic Vanity. 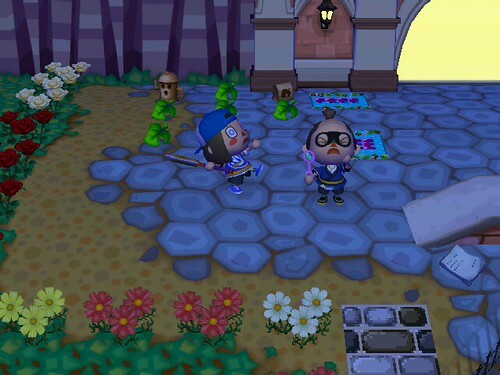 Wow, that Triforce is priced at 20,000 bells. That’s a BIT much, Redd! I bought the painting and rushed away. I see two little stars, facing off with only the power of their tiny starlight beams… They stand, growing in recognition of each other, and growing to blinding levels of brightness… At this rate, they will one day be envied by even the biggest stars… The stars surrounding you shine down with a soothing, gentle light. As they shine upon you, they illuminate a gentleness and universal appeal. During this shining time, you will garner support, especially from those who share your gender. Just remember that the way you see the world may have little to do with how the world sees you… That is all. Ahh, words of wisdom. So I guess I should hang out with the male townies in Shaolin and they’ll give me presents or something? OK then! 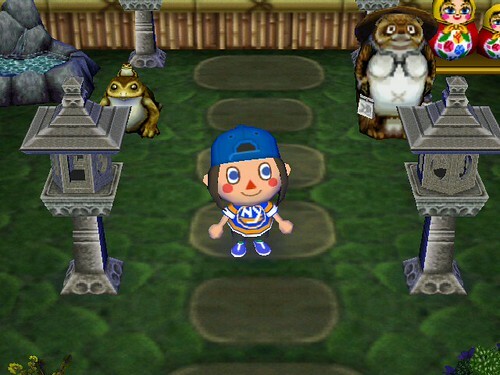 Ugh, Kapp’n is so annoying. He’s always making fun of Squirt for visiting salons. QUIT IT WITH THE OPPRESSSION, YOU STUPID…. uh… what is he anyway? A frog? Ruby wants a spider. But I can’t find any! I’ve been shaking tree after tree and all I can find are bee’s nests lol! I got bored so I checked the gate. And Chokomaru’s town was open! I ran through and was happy to announce to him that I’d received his letters! We hung out for a while, he showed me all the houses with their cool decorations. I especially liked the Japanese Garden in his wife’s house. So cute! And he had all these really cute patterns all around town, there was pretty waterways which I think are kinda supposed to be gutters, a really cute stone pathway pattern, and a bush pattern! It looks like an overhead view of a bush. It’s really cute, I took pictures but it was night time in Japan so they are a bit dark. 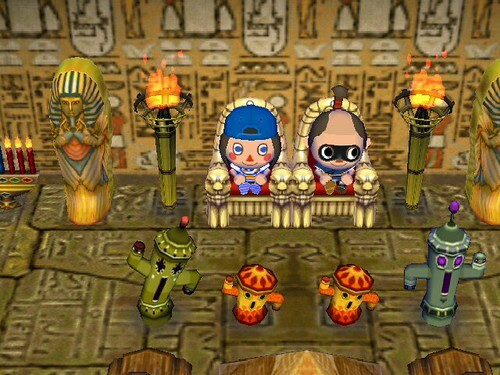 His Tomb Room is cooler than mine! Hey. Tonight is horrible for us. Might could be on after 10PM or a little between now [4.30PM and say… 7.30PM]. I’ll keep checking yr gate periodically. i still have never left friggin’ Plaahaus. Hopefully we’ll cross paths. 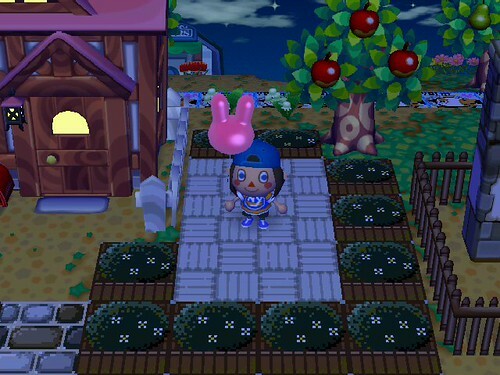 I can’t wait to see the pics of your visit to your friend’s town! 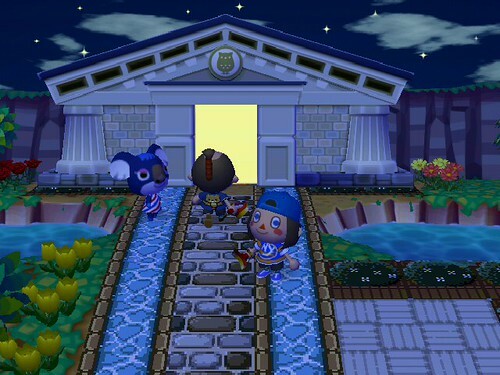 I like seeing different patterns and how others make their town feel like, well, a real town! Thanks about the Classic set! I will keep my eyes open for a Cabana Chair and/or Scoreboard too! I may have the Cabana Chair but I might confusing that with my Wild World catalog 🙂 I did have my gates open for a little last night. I was just starting to lay some patterns down. OH! Travis (my hubby! ), gets made fun of too by Kapp’n for going to Shampoodles!